I will cut to the chase here, the idea of the “fat burning” heart rate zone is bunk. Do you recall being in gym or physical education class, and seeing a poster on the wall which appears to elucidate the benefits of different heart rate training “zones”? Or are you otherwise convinced that maintaining a certain heart rate will optimize the amount of fat you are burning? The odds are that you are stifling your progress towards weight loss. As a quick primer on human physiology, your body draws energy (caloric energy, hence: “calories” or “caloric expenditure”) from one of three sources: carbohydrates, protein, and fat. Typically we don’t rely on protein as a major energy source unless the body is under a state of chronic starvation, so I’m going to focus on the remaining two, fats and proteins. As any given time, your body is using a combination of both of this caloric energy (or “substrates” as we refer to them in physiologist jargon), to fuel everything you do. This includes sitting, breathing, thinking, exercising, and even digesting food. What has been observed in human trials, and the reason this myth is so popular, is that the body burns the greatest proportion of fat when the heart is beating at approximately 60-70% of your maximum heart rate. Am I contradicting myself? It may sound like it, but what this argument fails to account for is that all calorie expenditure is meaningful in the context of weight loss, not just calories from fat. Calories spent from fat reduce adipose (fat) tissue in the body, and calories spent from blood sugar and other sources of carbohydrates will not become more fat (adipose) tissue. So the crux of my argument is that sheer calorie expenditure is a better measure of weight loss progress than “amount of time spent in the fat burning zone”. Said another way, if you would like a better sense of your progress towards your weight loss goals, direct more of your attention to making your workouts last longer, and getting your heart rate as high as you can sustain for long periods of time. Moving more means that your body is expending a greater number of calories. If you’re still unconvinced, and are worried about coming to harm by pushing yourself too hard, a KB Fitness certified personal trainer will be happy to safely and efficiently maximize the outcomes of your training and your goals. 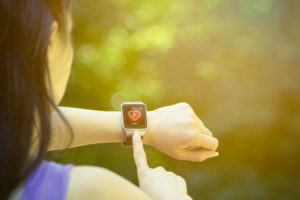 *There is a little bit of nuance to add to this discussion, the American College of Sports Medicine recommends 30 to 60 minutes of aerobic exercise at 40-60% of your maximum heart rate** five times a week, or 20 to 60 minutes of aerobic exercise at over 60% of your maximum heart rate** three times a week (or a combination of the two). Always strive for a level of exercise that you are able to achieve and maintain, but don’t make the mistake of thinking that a lower heart rate is necessarily going to help you realize your fitness goals. Disclaimer: This blog entry isn’t a substitute for medical advice, and always consult with a doctor before beginning physical activity. This is merely something for healthy populations, in particular those with no history of heart disease or blood pressure considerations, to account for as they begin intense exercise regimes.